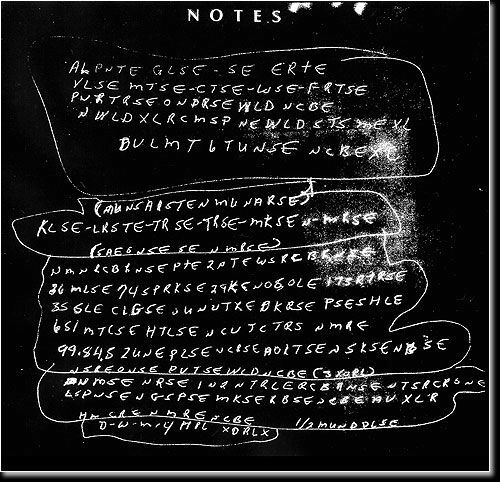 TO FBI: 7 POSSIBLE SOLUTION OF MCCORMICK´S NOTES (Chapter 7)= UNEXPECTED MURDER. +UNEXPECTED MUNDER IN NOTE 1 - LINE 12. +THE PROBLEM OF THE LETTER "thorn". +THE STAIN OF A HAND THAT WRITES SOMETHING. 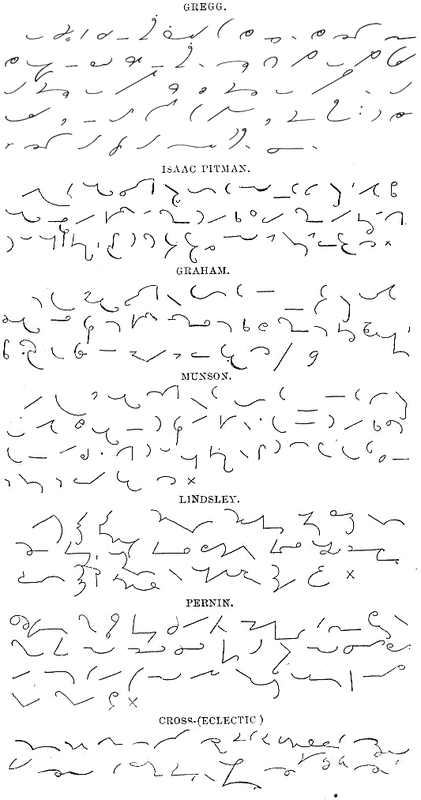 +THE GEOMETRIC CHARACTERISTICS OF THE SHORTHAND. +Note one looks good overall... and this is a problem. ---The note One looks like a finished work. Mccormick´s note 1, looks good. -TF= thief, by shorthand and disappears letter "h"
-"THORN"= old English letter "thorn". I suppose name of someone killed. NOTE Christopher Tritto on his journalistic report about Mccormick informs us of the violent death of Elroe Carr. READ MORE:"Code Dead: Do the encrypted writings of Ricky McCormick hold the key to his mysterious death?" + This may to mean that THORN is a shorthand symbol, a symbol of geometric shorthand. -c= had, by Caesar code B or +1 and disappears letter "h"
-mS= miss, discarding words as "mass, mess, moss, most , must, mash...."
-P= quit, by Caesar code B or +1 and discarding monosyllabic words with "Q/P"
-mRDE= murder, by phonetic solution: "ma:da"
-LUSE= loose, by phonetic solution: "lu:s"
Example from the SIMPSONS - Truck rental service store - S21,Ep11 "Million Dollar Maybe"- U TOTE means YOU TO TIE & CARRY. 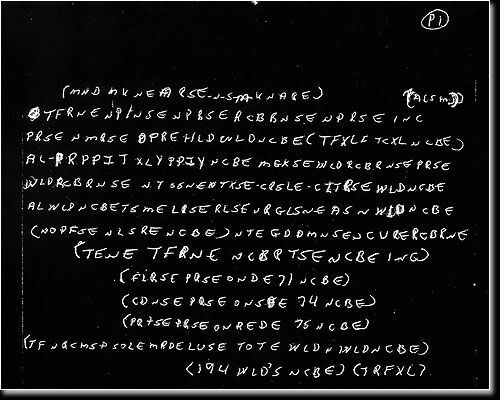 -c= had, by Caesar code B +1 and disappears letter "h"
THE PROBLEM OF THE LETTER "thorn". The sign 4, Is this the letter THORN? ---The fourth sign is not equal to the letter "THORN" capitalized, it may be a mistake or a usual sign in geometric shorthand. Anyway, i think it´s the name of a person. THE STAIN OF A RIGHT HAND THAT WRITES AND MEANS SOMETHING. Note 2 has a poor overall appearance and this is not by chance. 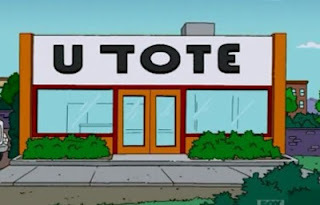 ---I think the stain observed is a hand in writing. Mccormick has worked with his hands and let his actions in writing immediately. Note 2 is a provisional note..... also looks bad. ---And i wonder if Mccormick had a watch on his right wrist. ---I am still looking for a murderer and murdered reported By Mccormick in Note One, line 12. ---McCormick should be related to someone's death, and this death was not due to be clarified and punished. -There is a kind of shorthand called geometric or shapes. -The signs are written with different shape and length that represent words. 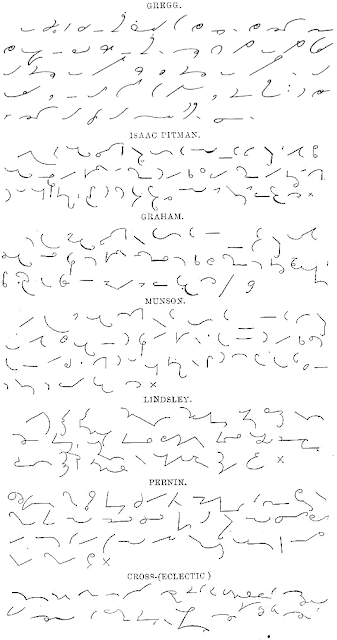 +The "lords Prayer" in Gregg system and a variety of 19 th-century geometric shorthand systems. 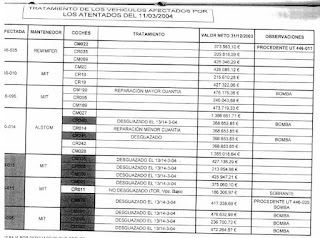 MURDER BY DECREE: A MASSACRE IN SPAIN . One train and one station. Were 4 trains in 4 train stations. This is a story of hundreds of murders by decree (and a story of police dogs trained to find explosives). 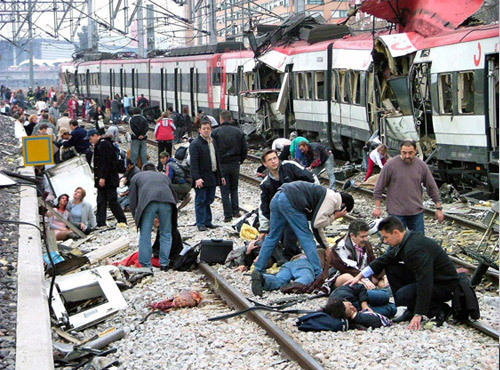 +The official version: 2004 Madrid train bombing. +Hannibal & Lovi: The trained police dogs and the first lies. +A wagon train that should be scrapped: The last official lie. 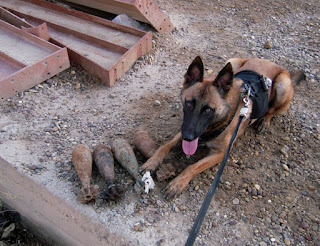 Riky, Belgium Shepperd, 3 years old, rest next to 4 mortar shells 60mm discovered during a patrol on November 26 (2008) in Rashid district of southern Baghdad (Irak). US Army photo of Sgt. James Harrington. -"Silver Blaze" is one of the Sherlock Holmes short stories written by British autor Sir Arthur Conan Doyle, is one of 12 in the cycle collected as "The Memoirs of Sherlock Holmes". "Is there anyother point to which you would wish to draw my attention?" "To the curious incident of the dog in the nigth-time"
"The dog did nothing in the nigth-time"
-"That was the curious incident". - So you know everything you need to solve this horrific crime. 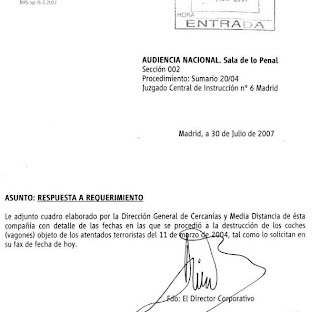 +The official version:2004 Madrid train bombings. -Three days before Spain´s general elections. 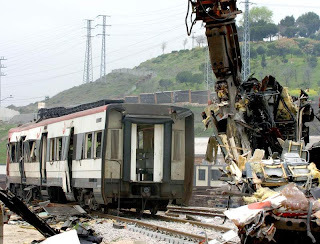 -The Madrid train bombings were simultaneous and cordinated bombings against the "Cercanias" (commuter train) system of Madrid, Spain, on the morning of thursday 11 march 2004 (7.30-8.00, UTC +1). The explosions killed 192 people and wounded 1857. -The official investigation by the Spanish Judiciary determined the attacks were directed by an al-Qaeda inspired terrorist cell although no direct al-Qaeda participation (only inspiration) has been officially established. Though they had no role in the planing or implementation, the Spanish miners who sold the explosives to the terrorist were also arrested. 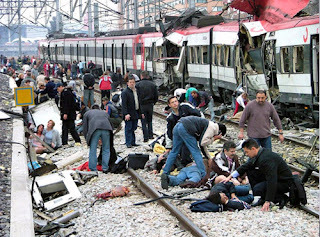 -On April 3, 2004, police located and surrounded several members of the terrorist in Leganes ( Madrid ). When cornered, its members , commited suicide by blowing up the floor that had been entrenched, this being first suicide attack in Europe, when the "GEOS" (they are similar to "SWAT") began the assault. In this action group killed a police agent, as well as all members of the islamist cell were present. +Hannibal & Lovi: The trained police dogs and the first lie. - In the official version the van Renault Kangoo which appeared in Alcalá (Madrid) plays a key role. It is claimed that the van transported the terrorists and their bombs on the day of the attack, and inside the police found under the passenger seat a garbage bag with 7 detonators and one piece of explosive cartridge. - The problem with this official story is that this van was revised in the crime scene by two different dogs trained to detect explosives: "Hannibal" and "Lovi". -One of the dogs inspected the van just outside, but if there had been explosives the dog would have detected. Anyway, the second dog came inside the van, and inspected, and could not find the slightest of any explosive that there would. And then the police was ordered to take the van to a police building without suspecting anything strange. There someone found the explosives. THE DOGS WERE TIRED !!! . -The defenders of the official version are forced to appeal to the argument that the day there was an attack and the dogs may be tired and confused by smell strange things. 1+The dog handlers responsible for the dogs who were at the crime scene testified in court that both the male dog "Hannibal" and the female dog "Lovi" only had two services earlier that morning. 2+First inspection work was done in the "Villaverde Alto" train station for a backpack that had left a student, and another work was done at the "Chamberí" train station for a handbag of a worker that resulted which contained food. -This means that the dogs had not been that morning at any time in any scenario where they could smell traces of explosives and explosions nor had only two interventions with the most common objects. 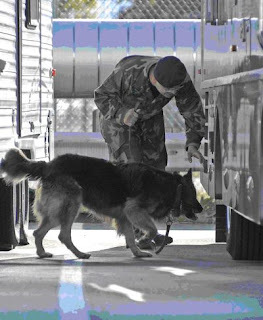 The dogs were not tired of smelling traces of explosives. -This means that there never were explosives in the van ....until the van reached the installations of the police, and some members of the police fabricated false evidence to acusse Muslims. More about dogs: Have you ever noticed how much dogs like to sniff and smell things? That’s because they have very sensitive noses. In fact, dogs can sniff out 19,000 explosive scents, which is an important job the dogs in CIA’s K-9 unit do daily to keep Agency officers safe. The destruction of the crime scene without judicial authorization (March-2004). El Pozo, Train Station, same destruction of the crime scene. -The day after the terrorist attack began the destruction of the scene of the slaugther without the usual order of the judge. At the trial police, prosecutor and examining magistrate asserted that all wagons where there were explosions were destroyed. -Defense lawyers were unable to examine the crime scene and they were unable to examine all available evidence. -We now Know that the police, the examining magistrate and the prosecutor lied. Inside there is the rest a wagon train that officially does not exist. The remains of a wagon train that officially does not exist. -This is the evidence that was discovered a few days. 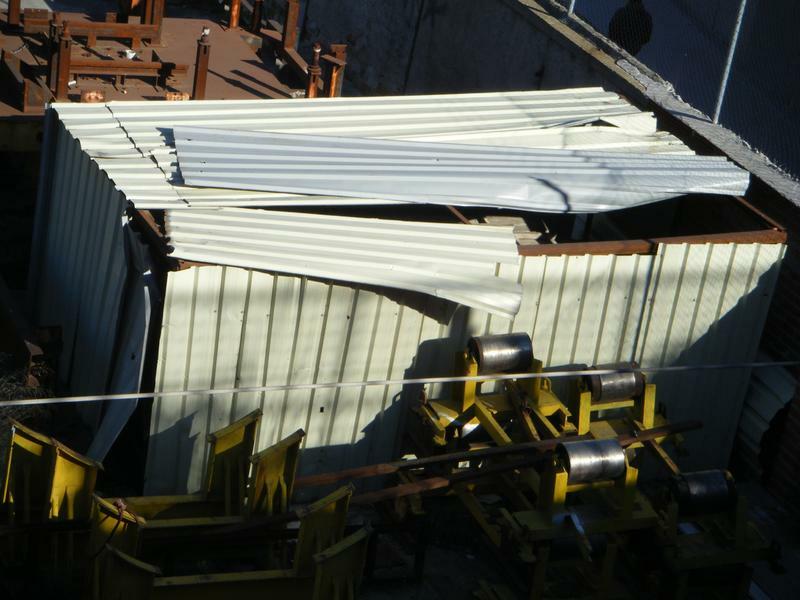 -Someone wanted to repair one of the wagons exploded at the "Santa Eugenia" train station and his remains are in the shed of a bankrupt company (TAFESA). -.....And there are many more official lies. Unfortunately for me and my country. +The official report of the railroad company (RENFE) about it the final destination of the train cars was delivered to the Court about a month after the end of the trial. + The trial ended 2 july, 2007. -a) RENFE said that the trains cars were destroyed on the 13th and March 14th, 2004. 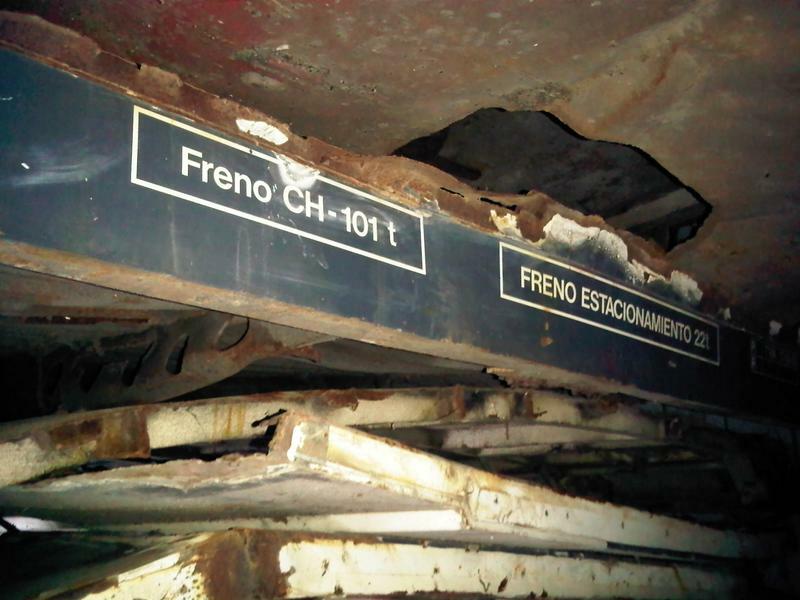 -b) RENFE said one train cars in which a bomb was repared but does not say where it is. 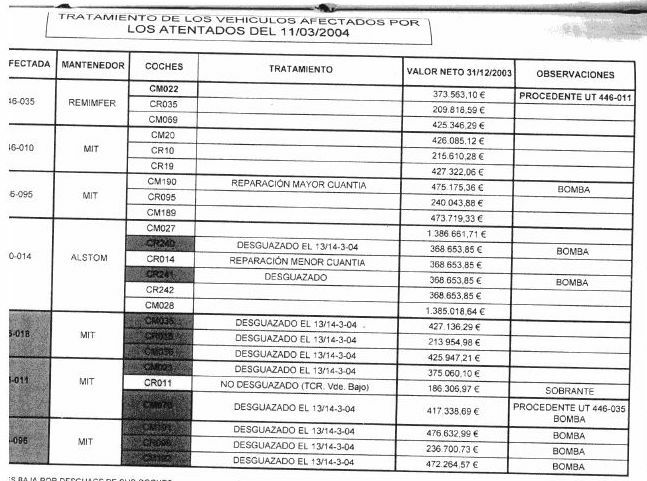 .......AS YOU CAN SEE THIS WAS DONE SO POORLY IN SPAIN JUDGEMENT ON THE MOST SERIOUS CRIME COMMITED IN MY COUNTRY.